Find food recipes for children that are simple, inexpensive and nutritious. Discover breakfasts for children, healthy ideas for lunch and fun desserts. Rich ideas of nutritious lunch for children. Find original recipes for sandwich rolls, healthy nuggets and more balanced recipes that include fruits and vegetables. If you are looking for nutritious food options for kids, here you will find the best recipes with nutritious ingredients that you will love. Find nutritious and easy-to-prepare breakfasts for children before going to school, as well as delicious fun recipes for a weekend. If you no longer have any ideas of what to prepare your children, we have delicious recipes that you can make and that you will surely enjoy. Find from the simplest recipes such as cheese taquitos, fish fingers and many more. One of the everyday situations that we face as parents is the feeding of our children. Is fruit juice recommended for children? One of the recommendations is to give your children freshly made fruit juice. Boys and girls, should they eat the same? Children's nutrition should be based on the principles of nutrition for adults. Creative and delicious recipes for your children to eat vegetables. Prepare vegetable soup or vegetable pancakes for children to eat rich and healthy. Are you looking for Kid's Dessert recipes? Kiwilimon has the best recipes for Desserts for Children tested with ratings, comments, tips and videos. We know that love is born out of sight, so we present recipes for fun meals for children, presented in a very creative way. They are recipes for kids prepared so that they are very attractive to them, and with this, they crave more. We present recipes for kids that are very simple to cook. They are so easy preparations, that they will not take much time to cook them. Here you will find meals for children that are very rich and quick to prepare. Fill your life with essential vitamins with these rich recipes of nutritious juices for digestion, energy, fat burning or to stimulate the immune system. Learn to consume all the nutrients you need naturally. Are you looking for Licuados recipes? Kiwilimon has the best Licuados recipes tested with ratings, comments, tips and videos. The best cooking recipes to prepare the children of the home, follow the videos step by step and surprise your family. 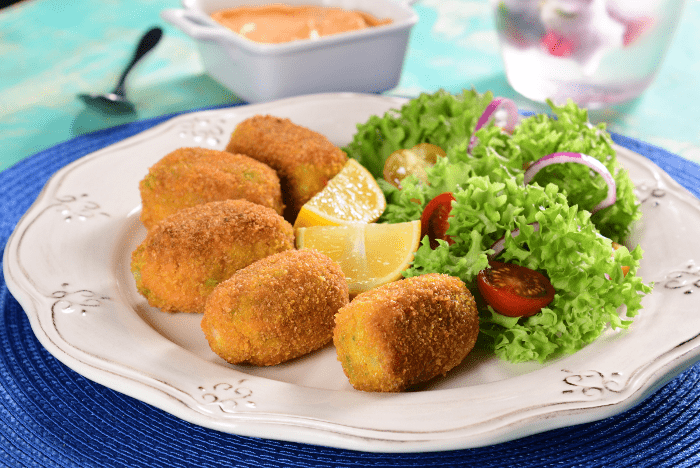 Croquettes are always going to be one of the favorite dishes of all, prepare these croquettes based on broccoli and carrots with Parmesan cheese breaded with corn flakes that will make them more crispy and delicious. You will love it. Enjoy a balanced and healthy dish was never so easy and delicious, prepare these breaded amaranth fish sticks with a yoghurt dressing and a touch of parsley and scallions that accompany these crispy bars, the best of all is that they are baked. Prepare these oatmeal cookies and make them your favorite snack, with their mix of blueberries and nuts they love children and adults, and the best thing is that they are very quick to prepare and the consistency is perfect. Try these delicious vegan hot cakes with intense banana flavor. They are fluffy and delicious and are accompanied with agave honey to give them a better contrast. Best of all, they are very easy to prepare. Because we know you love jellies, this jelly with fruit will fascinate you with its colorful presentation and a rich combination of milk jelly. It's perfect to surprise the whole family! These tacos of hot cakes are ideal for the breakfast of the little ones, the hot cakes mixed with cocoa and rubbed with a soft and delicate layer of Nutella®, filled with a mix of fruit cocktail, they are delicious. This dish is a delicious breakfast and, in addition, balanced for any member of the family. This back to school surprises your children with this original and fun snail egg sandwich! Rich egg roll with ham and cheese in the shape of a snail, accompanied by green leaves to simulate the grass, your little one will love. The traditional picadillo recipe that takes beef, you can also make it with chicken. This recipe for Homemade Chicken Hash and a touch of chipotle and extra margarine will give a spectacular touch to your homemade dish. Remember that for this easy recipe, slow cooking is key, so you should ensure that the cooking is very long so that it will taste better. Recipes with chicken can range from classic, to more creative, just like this recipe for breaded chicken stuffed with veggies, a healthy and very nutritious option. When cooking this dish we used margarine, which will give it more flavor since it has a higher smoke point, unlike traditional butter, it will not burn when cooking for longer times. If you want to decorate a cupcake cake like Spiderman, this tip will show you how easy it is. Dare to decorate these rich cupcakes and celebrate in style.